Another case of fraudulent voting to save the EU has occurred in the Austrian election. The Austrian Constitutional Court has revealed outrageous “errors” to the point that votes were simply regarded as non-binding recommendations. The investigations continue, but this reflects the desperate attempt to save Brussels at the expense of all of Europe. Allowing the people to vote was portrayed as dangerous so the election had to be rigged. This casts a lot of questions over the reality of the BREXIT vote to take place on June 23. Is there any hope for a real election at all? 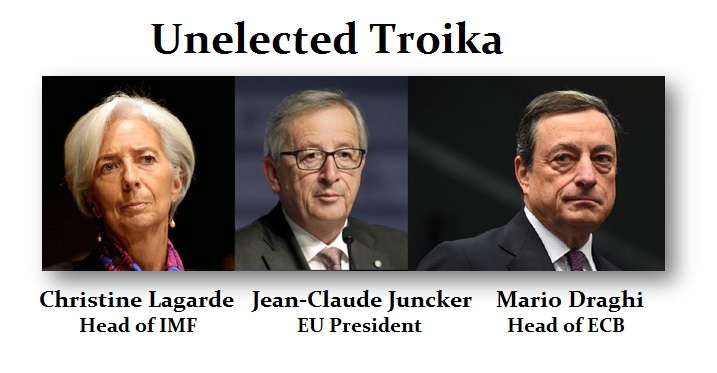 Unfortunately, those in Brussels, like the Troika, cannot be voted out of office since they have defeated any possible democratic vote. They never stand for election. The very people who dictate the fate of Europe, and are responsible for undermining all the pensions with negative interest rates, never stand for election but still tell the people it is a democratic process. Why any Brit would surrender their independence to become economic slaves to Brussels just shatters the mind. This is a dangerous situation, for the only means to reform or disagree with the policies in place will be civil unrest if not war. Meanwhile, in France, President Francois Hollande has proposed a ban on all demonstrations, according to his presidential spokesman. The excuse is, of course, that the country is plagued by terrorism and with Hollande less than 15% in the polls, the conditions are not in place to protect “personal or public property.” “At a time when France is hosting the Euro 2016 [football tournament], when it is faced with terrorism, demonstrations can no longer be authorized if property, people and public property cannot be safeguarded,” Hollande told a Cabinet meeting, according to his spokesman Stephane Le Foll, AFP reported. Very convenient. In Italy, the anti-establishment candidate is taking the lead in the Rome Mayoral Election. The disagreement with the management of the “establishment” on a worldwide basis is rising precisely in line with our Cycle of War. This is part of the cycle, and it is why we sadly will see Western civilization crumble when the financial capital of the world moves to China after 2032. Even in Japan, you have Finance Minister Taro Aso asking just how long the elderly intend to live, effectively saying die already to reduce the government payouts. The establishment is faking polls everywhere to retain the status quo and the press is in bed with them. Even the establishment Republicans are not raising money for Trump and want him to lose. Hillary is one of them. They do not want any outsiders. In London, Cameron is in bed with Brussels despite the fact he has lost every single negotiation to date with them. Is he an idiot or just corrupt? Brussels simply cannot allow BREXIT to succeed for it will signal the end of the EU, which they are desperately fighting on every front. This week will be extraordinarily important for the failure of BREXIT to win will most likely lead to a sharp rise in civil unrest throughout Europe. The machinations behind the forced federalization of Europe by the elitists from assassinations and political coups, right down to massive immigration to breed-out the European race, cannot be sustained. The whole refugee situation is a crisis since the majority of these people are not even from Syria and among their ranks are terrorists intent upon destroying Europe.